I will propose in the next months some articles regarding British hallmarks. Each article will be focused on a specific cycle of British hallmarks, not taken in a chronological order, beginning from the London Assay Office. 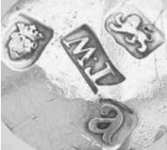 At the London Assay Office, each series refers to 20 years, starting with the date letter "a" and ending with the date letter "u" or "v". Only twenty letters of the alphabet have been used, excluding: j, v (or u), w, x, y and z. Note that the last letter of each cycle can be an "u" or a "v", but this is probably due to the fact that in the classic Latin language and alphabet there was no difference between "u" and "v". There is only an exception in the 18th century, prior the introduction of the Britannia standard (1696) (note 1 ), when the cycle lasted 19 years and ended with the letter "t". Also the next cycle (from 1697 onward) lasted 19 years, but in this case all the 20 date letters have been used. Each article will present real hallmarks stuck on wrought silver plate of the current standard (sterling, 925/1000 and/or Britannia, 958.4/1000). 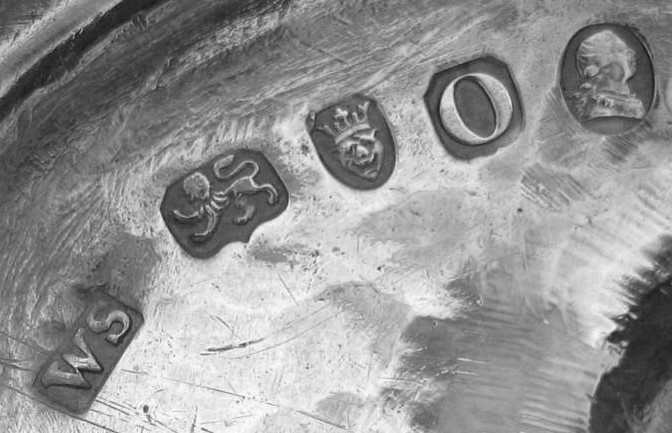 Although the procedure followed from time to time on hallmarking the silver objects is not the scope of these articles, I will present and comment, for the same date letter, different examples of actual hallmarks as found on various items. This is the introductory page of the article about London marks of 1776-1795 that will be published in the January 2011 newsletter. Its objective is to prevent mistakes in determining the date marks of the period subject matter of our article. 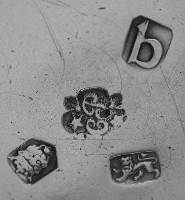 Small roman letters have been used at the London Assay Office for various cycles of hallmarks other than for the 1776 one: between 1736 and 1755; between 1816 and 1835; between 1896 and 1915. 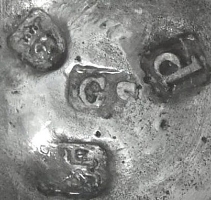 To avoid misunderstanding and wrong attribution, consider that inside some series were used punches of different shape to contain the date letter. This happened in 1736, 1776 and 1896. In the cycle 1618-1637 a mix of Italic and small roman letter was used and this can result, in a few case, in possible wrong attribution. Whereas it is very unlikely that a small collector can come into contact with items of this age, we cite this fact for information only. 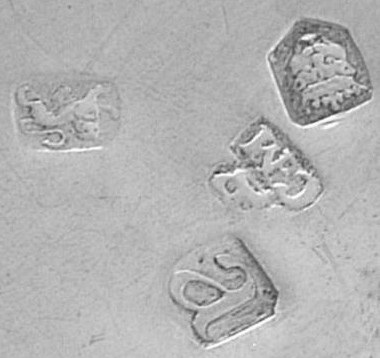 When punches have similar shape (1776 and 1816 cycles) some differences in the full set of hallmarks has to be taken into account (note 4 ). In particular, in the 1816 series the duty mark should be always present, with some exception for small items exempted from duty and (in a very few case as I can register) for detachable parts of particular items like teapot, coffee pot etc. Furthermore, after 1821 the leopard head is not longer crowned and the lion passant is not longer guardant. The cameo duty mark appears with and after date letter "l"
The duty mark should be always present in this cycle (beginning from date letter "a" - see the 1776 mark). Beginning with the date letter "f" the leopard head is not longer crowned (see London 1787 mark). 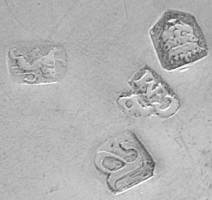 Punches are similar to those of the 1736 series after 1739 (see 1748 mark), but different enough to avoid confusion. 1) the date letters for the first four years of the 1736 cycle (note 5 ) and the corresponding date letters for the 1776 cycle. Date letters for 1737 and 1777 are similar, but the punches enclosing the leopard head are different. The 1737 mark has a punch with a pointed shield, while the 1777 mark is enclosed in a plain oblong punch. Furthermore the punch enclosing the lion passant for 1737 is a rectangle with rounded corners while that for 1777 has a pointed base or, sometimes, is an oval. 2) the date letter for 1789 and that for 1809. The "o" for 1789 is round outside and oval inside. The body of the letter has a different thickness at the top and at the base than in the middle part. The "O" for 1810 is slightly oval outside and inside and there is no thickness difference in the body. The other hallmarks are very similar. 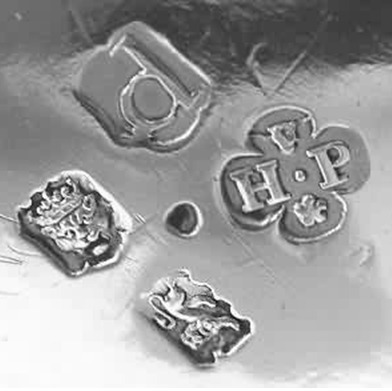 Note that in flatware hallmarks, since 1810, the leopard head is struck at 90� with respect to the other marks (see example on bottom right image). In hallmarks struck in this way the date letter "o" is certainly 1810 (while if the lion passant is struck normally, the date letter "o" may be either 1789/1790 or 1809/1810). 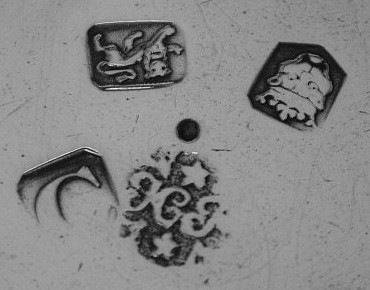 4 - A very comprehensive work about British maker marks is given at the link http://www.silvermakersmarks.co.uk/. It is more correct to refer to a "sponsor mark" rather than a "maker mark", mainly in case of manufacture employing many silversmiths, important retailers or import trade activity. 5 - In 1739 two different punches were used for the date letter "d", the first one can be confused with that of 1779. After 1739 the punch of the date letter or those of the other hallmarks of the two cycles differ considerably. 6 - "Stressed" hallmarks are hallmarks that have different shape than the usual ones, mainly regarding the ratio between highness and wideness. This can happen in case of reshaping of the item after hallmarking or in case of a late embossing. Charles J. Jackson, 1964. 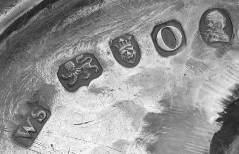 English Goldsmiths and their marks - A history of the goldsmiths and plate workers of England, Scotland and Ireland. Second Edition, revised. Dover Publications Inc., New York. Arthur G. Grimwade, 1976. London goldsmiths 1697-1837: Their marks and lives - from the original registers at Goldsmiths' Hall and other sources.